Sidney Fred Moden (1889–1916) was Rifleman (S/15364) in the 3rd Battalion, Rifle Brigade (The Prince Consort’s Own). 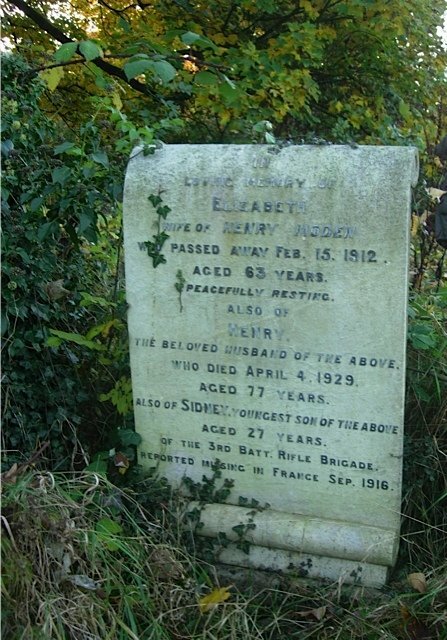 He is recorded here as reported missing in France in September 1916 died presumably at the Battle of the Somme. He is commemorated on the Thiepval memorial (Pier and Face 16 B and 16 C) as being killed in action on 19 August 1916. He is also commemorated on the war memorial at the Cambridge Guildhall. Sidney was born in 1889 in Cambridge. He was the youngest of seven children born to Henry Moden and Elizabeth Moden, formerly Peacock (née Rich). Sidney worked as a chef together with his older brother, Percy, in his father’s public house, The Wheatsheaf at 3 Market Hill, Cambridge. He enlisted on 11 February 1916 in Bloomsbury, London and became Rifleman (S/15364) of the 3rd Battalion, Rifle Brigade (The Prince Consort’s Own). At the time of enlistment he was living at 78 York Road, Lambeth, London. Shortly after enlisting he married Rachel Elizabeth Newman (1889–1968) in Cambridge. 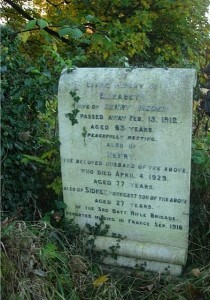 Sidney was killed in action on 19 August 1916 in France. He was entitled to the British War medal and the Victory medal. Sidney’s widow remarried in 1924 to a Percy C. Madgwick (c1892–1960). The War Graves Photographic Project; this grave was located and recorded by the Sixth-formers of the Parkside Federation, Cambridge on 14 November 2012.